Chez nous, Christmas morning started on a happy note, with an excited DS dragging his stocking into his parent's bedroom.. his sweet anticipation of all good things to come was infectious. 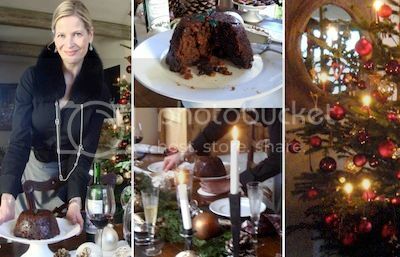 Having not had much time this year to prepare for Noël, I was very glad to have made our Christmas pudding back in November (recipe to be shared when making it next year). DH did a great job choosing a beautiful tree while I was away, and I was happy to have found a place to stock up on tree candles, as they can be difficult to get here. 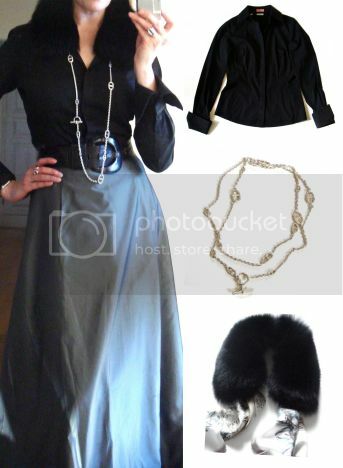 Accessorised a black shirt and a long taffeta skirt very simply with a new black MT fox fur collar, held in place by a Farandole necklace. I hope everyone enjoyed a blessed and merry Christmas and holidays! When I was a child, my mother used tree candles. She brought them from Bavaria when we moved back to America. She'd light just a few each year, and just for a couple of hours on Christmas Eve, in order to save them for Christmases to come. Wonderful memory--thank you for bringing it back. Your tree is delightful. As is your skirt! What a beautiful sight...the candle lit tree,your Xmas ensemble and most of all your beautiful smile! Your Christmas looks to have been quite lovely. I really like your simple ensemble, so elegant! Are those real candles on the tree?? Dar MaiTai - Thank you for both posts during this difficult time. My BF, who is of German, still uses real candles on her tree - such a difference to lights. Beautiful photos as always. Wishing you and your Family Peace and Health in the New Year. You always look so beautifully dressed regardless of what you're wearing. Merry Christmas to you and your family. I'm sorry to hear about your mother. Hopefully, the happy memories you've had with her will ease your pain a little. I love tree candles but I am so neurotic that i'd have to sit in front of the tree upon a small stool for their lit duration. I hope you and your family had a wonderful Christmas! Your tree is absolutely beautiful! Thank you, MaiTai, for continuing to post during what I'm sure is a very difficult time. I love your skirt and the way you paired it. And it's so good to see your beautiful smile again. This Christmas can't have been easy for you and I thought of you lots. Tree candles! My last memory of them was when I was about 13 and our neighbor who was German decorated her tree with candles. All was well until her son became a bit rowdy and toppled the tree causing things to ignite! The living room had a little redecoration after that episode! So glad your DS was able to bring you Christmas joy this year. Your ensemble is so beautiful and the fur collar the perfect touch. What lovely photos from your Christmas. I love the fact that you dressed up in your skirt. So many families now come to the Christmas table in jeans and a t-shirt. I try to keep the old fashioned tradition of proper dress alive with my family. The photographs of your Christmas are stunning, as are you in your lovely outfit. I too love the tree candles! We also make our Christmas pudding and the Christmas cake in November, and I love spending the time cooking with my mother. We used to cook with my adored grandmother before she died, and so at Christmas it is always a time that we think of her even more. Thank you so much for taking the time to post, especially since it has been such a sad time for you and your family. May this christmas bring joy and happiness for you and your family. I am so sorry to hear about your loss. Your mother is very beautiful and elegant, just like you. I believe your mother will always live in your memory. Merry christmas lovely MT ... thank you so much for your beautiful posts. Dear Trudye, Deja Pseu, Maisie, Chocolate, Cookies and Candies, Faux Fuchsia, Macs, Tabitha, Hermes Newbie, booksnchocolate, gracekelly, Belle de Ville, Melusine and Erlina ~ hope you all had a lovely Christmas. Thank you for your kind comments, so lovely to hear that you liked the outfit and Christmas pictures. The tree candles are very special to me. For my whole life, I have never been without their special glow. An improvement was made 15 years ago, thanks to DH, when we introduced additional electric lights, so that our tree now also shines inbetween lighting the candles. Hello Deja Pseu, so happy to hear you like the look. And yes, the candles are real! Thank you for your good wishes, dear Maisie. So nice to hear that your BF is holding up the tradition. Wishing you a blessed and happy New Year. Many thanks for your kind comment, and warm words of sympathy, dear Chocolate, Cookies and Candies. I hope you had a merry Christmas yourself, and all my best for 2011. I hope you’ll find a blouse for your skirt soon, my dear lovely Macs. I’ve had the skirt for so long, and it’s fun to experiment with different tops. The shirt is my current favorite. I don't know either if the saying exists in english, but langer Rede kurzer Sinn, hugs to you! PS Loved your description of the Mistletoe in the previous post, so poetic. Oh Tabitha, you made me laugh with your description of you sitting on a small stool! Come over here, and I’ll offer you an armchair and a glass of champagne instead! OMG, dear gracekelly! This is quite a memory to have of tree candles, how dramatic. Will definitely have a fire extinguisher at hand when DS hits adolescence.. I am with you, Belle de Ville! Dressing up is very much part of it for me too, and I remember my mother doing the same, making it all the more special and memorable. I hope DS will remember the same when he’s older, as I am sure your family will too. Dearest Erlina, so lovely to see you again. Many thanks for your kind words, and your sympathy. Wishing you a happy New Year 2011! Happy holidays, dearest Mai Tai! Thanks for sharing little snippets of your life. LOVE the photos -- you look so gorgeous and elegant as usual and your tree is simply beautiful. There is something special about a non-fake tree and I can only imagine how warm and inviting yours must be with its glowing tree candles. Your DH is such a darling. Here's wishing you much love, fulfillment, good health and many reasons to smile in 2011! 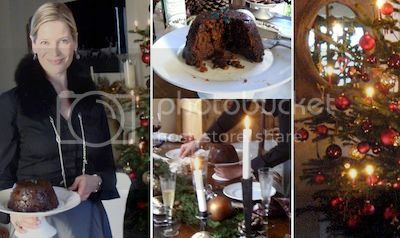 The pudding looks amazing, and I absolutely love your tree, and those candles too! Simply magical, belated Christmas wishes, and a happy 2011! Simone, so happy you like the tree. Finding a good one (with even branches) is sometimes not an easy task, especially here in the South of France.. so it is all the more wonderful that we had a beautiful one this year!